Amethyst is a variety of purple quartz. This pendant is specially facetted by the Astrogems factory in India and set in Sterling Silver. It is carefully shaped so that there is a smooth, wide surface area of skin contact over the throat or heart chakra. Amethyst has been revered for millennia as a sacred gem that has helps to spiritualize a person's thoughts, strengthen a one's will to avoid addictions and for it's soothing qualities. This very large gemstone has a deep color for potency and has not been heat treated. 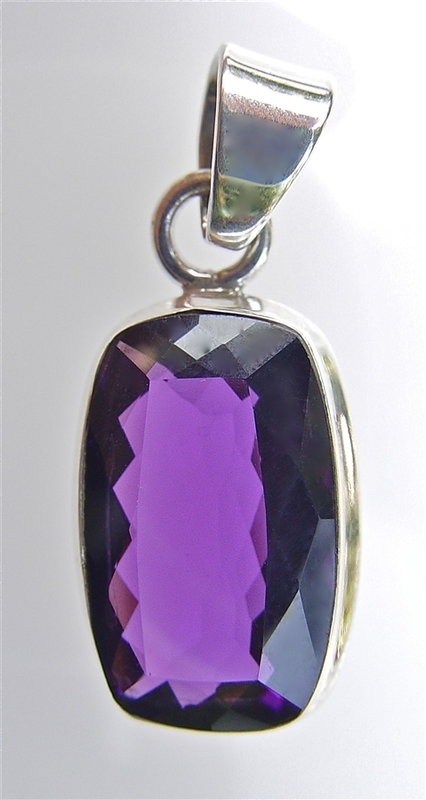 The dimensions of the gemstone pendant are: 2 cm long, 1.7 cm wide - total length is 4 cm, weight is approximately 40 Carats.